The National Entrepreneurship Network (NEN), a part of Wadhwani Foundation, was started by Romesh Wadhwani, almost 12 years ago to help emerging countries create jobs. Recently, the Wadhwani Foundation launched NEN in Malaysia, with Cradle Fund as its strategic partner. 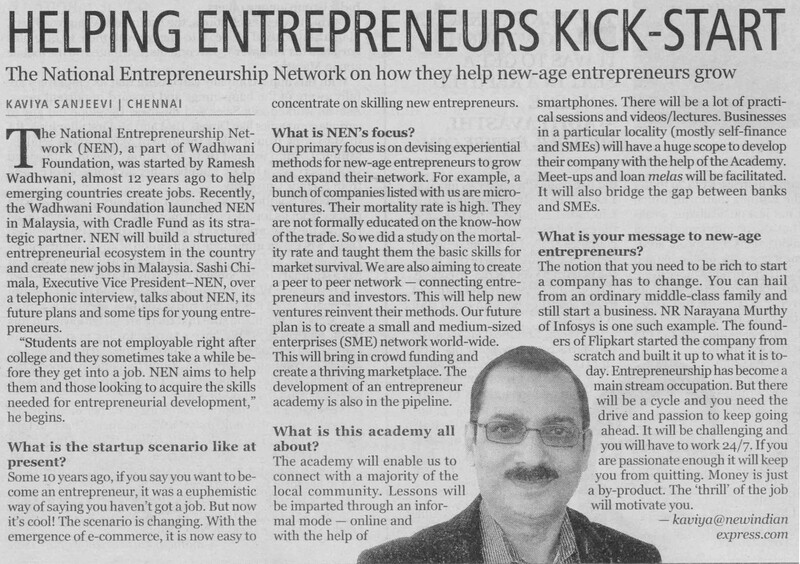 NEN will build a structured entrepreneurial ecosystem in the country and create new jobs in Malaysia. Sashi Chimala, Executive Vice President–NEN, over a telephonic interview, talks about NEN, its future plans and some tips for young entrepreneurs. “Students are not employable right after college and they sometimes take a while before they get into a job. NEN aims to help them and those looking to acquire the skills needed for entrepreneurial development,” he begins. What is the startup scenario like at present? Some 10 years ago, if you say you want to become an entrepreneur, it was a euphemistic way of saying you haven’t got a job. But now it’s cool! The scenario is changing. With the emergence of e-commerce, it is now easy to concentrate on skilling new entrepreneurs. Our primary focus is on devising experiential methods for new-age entrepreneurs to grow and expand their network. For example, a bunch of companies listed with us are micro-ventures. Their mortality rate is high. They are not formally educated on the know-how of the trade. So we did a study on the mortality rate and taught them the basic skills for market survival. We are also aiming to create a peer to peer network — connecting entrepreneurs and investors. This will help new ventures reinvent their methods. Our future plan is to create a small and medium-sized enterprises (SME) network world-wide. This will bring in crowd funding and create a thriving marketplace. The development of an entrepreneur academy is also in the pipeline. What is this academy all about? The academy will enable us to connect with a majority of the local community. Lessons will be imparted through an informal mode — online and with the help of smartphones. There will be a lot of practical sessions and videos/lectures. Businesses in a particular locality (mostly self-finance and SMEs) will have a huge scope to develop their company with the help of the Academy. Meet-ups and loan melas will be facilitated. It will also bridge the gap between banks and SMEs. What is your message to new-age entrepreneurs? The notion that you need to be rich to start a company has to change. You can hail from an ordinary middle-class family and still start a business. NR Narayana Murthy of Infosys is one such example. The founders of Flipkart started the company from scratch and built it up to what it is today. Entrepreneurship has become a main stream occupation. But there will be a cycle and you need the drive and passion to keep going ahead. It will be challenging and you will have to work 24/7. If you are passionate enough it will keep you from quitting. Money is just a by-product. The ‘thrill’ of the job will motivate you.